While traveling the globe this year for Design Outreach, I heard several responses from recipients of the LifePump I didn’t expect to hear, “Now I get to go to church” and “I’m praying for you so that other villages can get one of these pumps too.” I can’t stop thinking about our brothers and sisters across the globe in very poor, desperate situations. I’d like to share a story from my trip, so you can get a glimpse of how you are changing lives in Haiti. It was a hot and muggy July afternoon. We arrived in Port-Au-Prince and took a Missionary Aviation Fellowship six-passenger Cessna to the remote but well-inhabited area of northwest Haiti. The flight offers a beautiful view of the blue Caribbean ocean and mountains. As one missionary told us, “Haiti at 1,000 feet looks like paradise.” The situation on the ground looks much different. People are struggling. Kids are suffering. Witchcraft is rampant. We landed and were soon greeted by missionary and former Boeing engineer Bruce Robinson. He loaded our team into his four-wheel-drive Land Rover and we took a very bumpy ride over dirt roads to their guesthouse. Bruce’s experience as a 30-year missionary brings a wealth of knowledge, strong relationships with the Haitian people and great inspiration as our first LifePump partner in Haiti. The next day we drove about an hour over nearly impassable roads to a small village called Raymond Jean Bois, an area suffering from a lack of safe water. A recently installed LifePump is located next to a church, and we saw long lines of people from miles around getting water. The LifePump replaced another pump that kept breaking down and driving people to unsafe water sources. 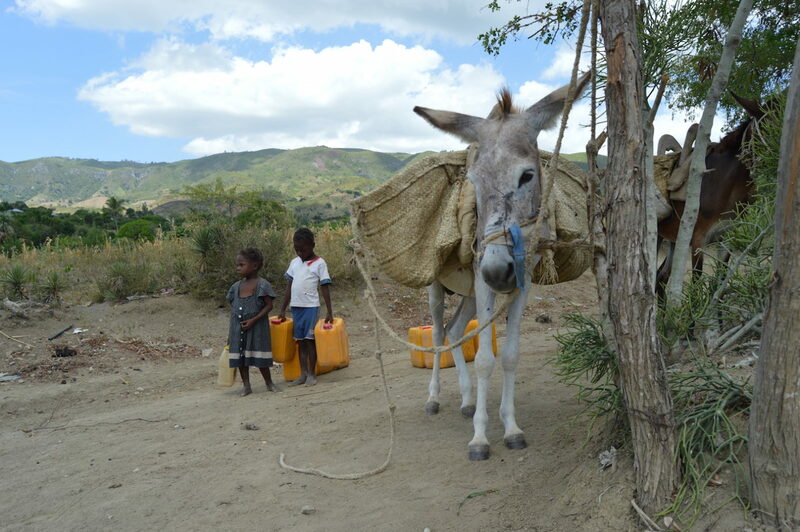 What we didn’t realize was that Sunday, like every other day, the women walk about three miles to the nearest water source and do so very early in the morning to avoid the hot Haitian sun. This means that church is over by the time the women return to the village. What you are doing is making a significant difference in the lives of people in difficult situations. Thank you for caring, giving your time and money, and creating a lasting impact. We started Design Outreach to share the love of Jesus by helping people the right way, the best way, and this almost always takes more time and money than alternatives. Presently, we are in conversations with national governments in Africa and Haiti, as well as the world’s largest nonprofits such as World Vision, about expanding the use of LifePumps. This happens because we’re solving real problems, doing it the right way, and praying much and often. So what can you do? Pray fervently and give generously. So much of the world needs our help, and every single person like Maricien matters. I have witnessed the jubilation and thanksgiving that accompany bringing water to a village. To me, it is worth any amount of sacrifice to bring about just one story like Maricien’s. By continuing your support of Design Outreach, Maricien’s story can become the story of other women in Haiti and across Africa. May God bless you as you enjoy this wonderful Christmas season! P.S. We appreciate your prayers and want to pray specifically for you too. Please email me and let me know how we can pray for you. My email is greg@doutreach.org.